This is the wall of the Temple Mount, taken looking straight up. The wall is so high, the stones so large...it just boggles my mind how it was made. 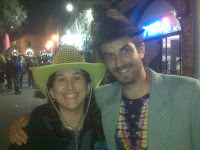 Purim celebrations in the Old City of Jerusalem. This is part of the Cardo, an ancient corridor through the Old City. These ancient stones were really brought alive by all the kids running and screaming and playing....the loud music playing, the food, the games, all of it...having shaving cream fights...it was so fascinating to see this area which is usually empty save tourists filled with the residents of the Old City! And here are some more ancient stones, the Kotel or Western Wall, juxtaposed against other Purim costumes. Read more about my trip here and here and here and here. YahaDudes - I got one in duty free in Ben Gurion! I can never quite believe that we only have 4 weeks between Purim and Pesach. It just doesn't seem fair. Time to start cleaning, prepping, teaching, shopping, worrying...and of course, singing the Pesach songs! I have also started trying to teach the Four Questions to my 2-year-old. I figure he might be able to get the first line down. Or maybe I'm being ambitious. I never seem to have the time to really devote to the whole process either. There's always the Quilting Retreat and the Women's Seder and just...life in between. But this year I have a plan. I'm going to...wait for it...take some time off from work in order to prep for Pesach. But I think this plan can work. Since I'm not quite ready to commit to what I'm going to make or how I'm going to make it, I'm going to ease in by beginning the process of finding all the Pesach stuff (conveniently located in boxes in the basement marked Pesach) that I will need. I thought I'd begin a sporadic series here at Ima on and off the Bima and follow my Passover Preparations for the next couple of weeks. Join me! It's simple, creative, and interesting. My favorite recipe is Toasted Matzah Farfel on page 72. I make at least a double batch every year. Yum! Plus I have a lot of printouts from the internet and copies from cookbooks that aren't devoted only to Passover. I keep all this together in a folder in one of those Passover boxes I mentioned before. Moosewood Celebrates has a great Matzo Casserole recipe. Is anyone else wondering where jewish-food.org went to? I have a ton of great recipes from them like Farfel and Cheese (a yummy casserole that tastes like mac and cheese), Cupcake Blintzes, and like forty varieties of Passover Muffins/Popovers. But where did this site go? Good thing I've printed out my favorites. 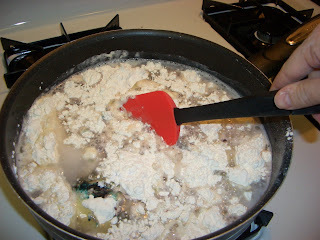 Allrecipes.com has a great set of Pesach recipes too. Like this Spinach Frittata...yum. Oh, and as far as recipes go, if you're really convinced that you should make your own matzah, here's a recipe. Coming up next in the series ...favorite Passover music! Also...if you want some resources for leading a great Seder, check out this at Amazon. A Mother in Israel will be hosting the next Kosher Cooking Carnival on April 7, so get cooking! Topics will include Pesach recipes, kashruth on Pesach, preparing for Pesach, Purim accomplishments and recipes for getting rid of hametz. And anything else relating to kosher cooking. You can submit your own posts here, as well as any other posts you would like to recommend. Check out the most recent one, KCC #28 over at Frumhouse. Special thanks to Batya, who organizes the whole thing. But this meme is pretty darn silly. The closest book is: Betsy and Tacy Go Over the Big Hill by Maud Hart Lovelace. * Pick up the nearest book of at least 123 pages. They saw a cloud of dust and heard the thud of hoofs. A team of glossy white horses flashed into view. They were driven by a coachman who wore a plug hat like a coachman in a parade. A glittering open carriage swayed along the narrow street. Betsy, Tacy, and Tib glimpsed a white beard...a black veil. Here were Mr. Meecham and his daughter! I'm not sure what the purpose of this meme is but I hope, in this case, that it inspires you to go out to your nearest library and check out the Betsy-Tacy books. They are great, the first one is short and they get progressively longer. Perfect for reading aloud to your kids (or reading yourself)! no parsha haikus for you. just wait til next week. Coming back from Israel is always bittersweet. I love returning to my family. I can't wait to see and hold each of them. I am glad to return, to be here where (most....) of my family is. But it is always jarring to me to hear English all around. To see signs in English and not Hebrew. To look around and feel reasonably sure that I'm back in the minority. To see children in baseball caps instead of kippot. To not feel a compulsion to give any young soldier a motherly kiss on the forehead (not that I saw so many soldiers in O'Hare, though). Coming back from Israel...even though this is definitely my home, I always have a hard time saying that I'm going home when I leave Israel. A piece of me is always there, my home away from home, my heart-land. I love introducing people to this land I love so much. To see through their eyes the sights and sounds and smells, to taste anew each visit the felafel, halva, even bamba (which I'm not such a fan of, sorry Israeli friends)...as I pointed out to our group, even Coke tastes different here. The very air is different. We started with an excellent discussion/lecture with Professor Reuven Hazan. He was interesting and engaging, he talked about Israel's pollitical situation today and the group was really riveted. Then we headed for the bus...as I said beofre, we were a little delayed by Cheney's motorcade and then we were off...heading down south to the Dead Sea and Masada. We didn't have the time to tour Masada (as I keep saying to the group - there's always more to see, always something that will keep for the next visit!) but we did what we came for - celebrated TEN Bnai Mitzvah! It was hot and sticky and crowded but it was pretty amazing to watch 9 kids and 1 adult read Torah together in Israel. It took 18 aliyot! That's a lot of Torah. It was really fantastic. We headed back down just before the last cable car and that was my goodbye to the group. They are heading to my favorite part of the country, the North (well, I like Jerusalem too. Perhaps, like the Torah portions, they're ALL my favorites!) and will be in Tiberias, the Golan (jeep riding and ziplining! ), Tsfat and more...then Tel Aviv and then back to Chicago. I'm sure they'll have a great time (and I hear its going to cool off!!!). I could get used to this...being a regular visitor to Israel. It certainly does feel like home away from home. I'm looking forward to seeing my family, though, and catching up on life....oh wait, I'm off to quilting retreat next week....ack! Still, it's all good. See you on the far side! Vice President Cheney is here in Jerusalem too! On our way back into Jerusalem, as we were driving by the Knesset building, we had to stop for his motorcade. He stayed at the King David Hotel which is down the street from ours. When we got back to King David Street we ran into the motorcade AGAIN! After a quick lunch, we conclided our visit to Yad Vashem with a walk through the Valley of the Communities. Each family took a spool of ribbon and went to find withinthe valley the name or area from which their family comes. Then they unspooled the ribbon from their town back out into the main section. All those ribbons came together and were held by the children. Such a beautiful site - all those colorful ribbons, all those sweet children...our past and our future coming together to remind us WHY we come to Yad Vashem - so that we remember the past and build our future. Then we headed down to Moshav Shafir, about an hour south and west to visit our Federation Partnership 2000 region, a region with which we have a pretty direct connection - exchanges of people and volunteers, gifts and assistance...it's a really amazing and real partnership. Israel is experiencing a heat wave! It was in the nineties and the heat is intense - way more than usual in March. This made our outdoor project a little uncomfortable but still pretty great - we helped to create a bike path using hoes and picks. We also heard a wonderful story from a woman who had been a teenager during the War of Independence - an experience in that very spot in Shafir. (More on this another day - it deserves a whole post!) And we met the Gerge Washington Carver of pomegranates - a man who has invented many uses for this famous fruit. We headed back to Jerusalem where some of us headed out to enjoy the last hurrah of Shushan Purim....still great and crazy and fun! And tomorrow....off to the south! Even though Shabbat is a day of rest, we had some optional activites for our group. In the morning about 40 of us went to Rehovot to the bullet factory in Har haKibbutzim. This was a secret underground factory that made bullets for the Haganah for three years before 1948. It was a really amazing story and a great museum. It always boggles my mind how young these people were who created the State. The workers in this bullet factory were as young as 16. We have in our group a 16-year-old young man and I couldn't help but look at him and imagine him there, making bullets and working in furtive secrecy to create bullets for the resistance. We returned to Jerusalem and had a lovely lunch and then met in the afternoon for the Tourgame (also optional! )....an educational scavenger hunt through the Old City - it was awesome. I have been in the Old City many times but even I loved it! We were all over the Jewish Quarter and learned a lot about all the places and history. We had to search for sights, answer questions and follow a map through the route. It was really great - I would definitely do it again! Then Shabbat was about to draw to a close.... I headed up to the Tayelet to join three Am Shalom families who were celebrating their Bnot Mitzvah with Rabbi Steve. The view was breathtaking and the closeness of the Temple Mount was amazing. I slipped in at the end and shared a really magical and spiritual experience with these families. We went back into Jerusalem and our whole group (including the Bnai Mitzvah families) joined together on the patio of the David Citadel hotel, overlooking the almost full moon over the Old City. The view was amazing and the atmosphere incredible. To share Havdalah in such a space...words cannot describe. This day was spent in wonderful celebration of Jerusalem. We went through the amazing Southern Wall excavation site. This is the really incredible archaeological exporation of the southwest corner and southern wall of the Temple Mount. I'm not sure I can even express in words how I feel (especially not while typing on my bberry - I think this may have to be a more thorough exposition when I get home, but...) about this site. It is truly breathtaking to me that we have dug up and learned so much about the Temple Mount. What boggles my mind though (here's where expression gets tricky) is how we treat this part of the Kotel (wall) as a historical site whereas the "Western Wall" usually called The Kotel is viewed as a religious site. It's the same wall! Yes I know there is historical significnce to the only piece of the temple mount that we have had access to for hundreds of years but why is that "the real Wall" and the other merely a museum piece? More on this later. After the Southern Wall site we visited the Kotel Plaza and had a chance to say our own prayers and place written prayers in the cracks of the wall. Then we explored the Jewish quarter, spent a little time shopping in the Cardo, and had a great felafel lunch in the Old City. We arrived in Israel in a beautiful sunny morning. After a brief stop at the tank museum in Latrun, we had a beautiful brunch at Pinat Shorashim, on the grounds of Kibbutz Gezer. Pinat Shorashim is an educational garden - simply beautiful - and the site of Israel's first baseball field. Then we headed to Beit Guvrin for "dig for a day." Archaeological Seminars was founded by Bernie and Fran Alpert, of Highland Park, IL, as a chance for regular people to really experience archaeology in Israel. Everyone in our group really enjoyed digging in the caves and finding shards of pottery. Then we headed to Jerusalem and sopped at Montefiore's Windmill to overlook the Old City and say Shehecheyanu - the blessing for special moments. Personally - this spot is very significant because it is the site where my husband proposed to me!!! Overlooking our favorite city....it is probably my favorite spot in the world. I can't wait to stand there someday with my children and God willing my grandchildren, as so many in our group did. We checked into our hotel and cleaned up a bit before dinner and a little Purim celebrating, followed by a trip to the Western Wall Tunnels, the excavation of the Temple Mount along the Western Wall (Kotel). Everyone was exhausted and most headed to bed. I went over (with Rabbi Steve) to the Ben Yehuda area to check out some of the Purii m festivities (more on Sunday, since we are in Jerusalem) and have frozen yogurt. We ran into my brother in his goofy costume. In true Israeli fashion, he is celebrating Purim all over - tonight here in Yerushalayim, tomorrow in Tel Aviv and then back to his kibbutz. ...and then finally to bed! Whew! What a day! A long and wonderful introduction to our trip!!!! As I've said before, I'm not a big fan of Halloween. It's overdone, it's overhyped, it's over-sugared, not to mention that it's not exactly based on my religion. David: Mom, I want to be an Ice Ninja for Halloween. Me: That costume costs $40. Him: So will you buy it? Me: Nope. You have to earn the money yourself! Now, you might think that I would have my kid wear the same ($40) costume for Purim. 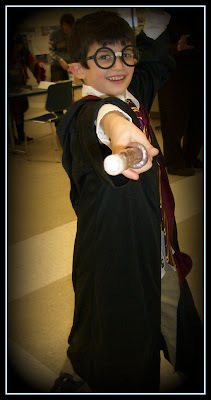 David: Mom, I want to be Harry Potter for Purim. So I bought him a Harry Potter costume. For about $40. I even bought a light-up wand. 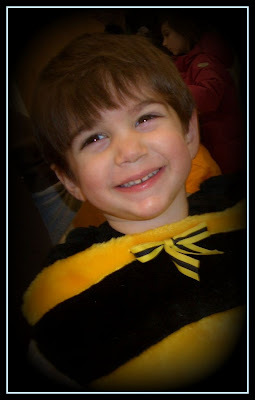 And I reminded him as I gave it to him that he earned the other costume but this one was a special Purim gift. And I think he got it. 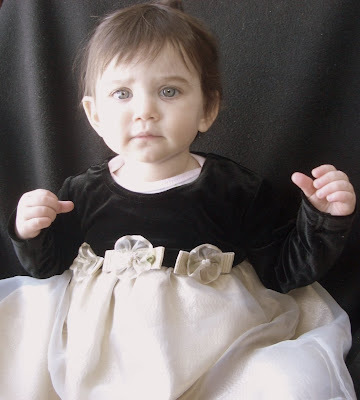 See what Frume Sarah has to say today...our Purim Party is going strong! P.S. I'll be in Israel again starting tomorrow, just until Tuesday. Please try not to post anything earth-shattering, okay, since I won't be reading blogs. You can, however, follow my trip here at my blog! We each have our own Torah*. It may vary from day to day or even from hour to hour. We all hold these ideas inside us that are screaming to get out. Sometimes they are brave or revelatory or interesting or funny or silly or sad. But they are the truth, and they are ours. So I invite you to seek truth, to share truth, and to open yourself up to truth...every Tuesday here at Ima on and off the Bima, we will celebrate our own Torah, our own truth. I much prefer the character of Vashti in the Purim story. Vashti was the one who said "no way" to her husband when he demanded that she dance naked. Vashti stood up for what she believed in, and she didn't mess around when his indiscretions (what an annoying term) came out. Esther did what she was told. She listened to her cousin Mordechai, she dressed up in her pretty clothes and went before the king. I'm not discounting her own bravery, but I'm saying that she did what she was asked to do. She wasn't the type to say no to her family. She baked cookies and did what was expected of her. I'm not always interested in what others expect of me. Like Vashti, I want to be able to say no to the things I don't want to do, the things that I feel are a contradiction of my own personal values and beliefs. Vashti was sent away from the presence of the king. She won her freedom - she won the right to own herself and say and do what she wanted. She earned it. And we all earn it every day. I'd rather hear her story, I think, than the story of Esther. I know, I know, the Book is named for her. I know, I know, that she is the heroine, the savior of her people in a tight spot. But the stories of the girls like Vashti tend to be a bit more interesting. And that's my Torah this Tuesday. What's yours? Leave a comment linking to your Torah post. See you here next Tuesday! Join the Purim Party! Check out what Frume Sarah has to say today too! We're having a party! The holiday of Purim is coming up this week and FrumeSarah and I are hosting a big ol' party with lots of fun and silly Purim posts! Plus something that I think is really cool coming up on Tuesday...stay tuned. God tells what to do. part to burn by priests. make you do this one. 1. Purim is a Jewish holiday that celebrates the redemption of the Jewish people from the evil Haman's plot to destroy them in Persia. It's based on the Book of Esther. 2. The holiday is celebrated with a lot of fun and silliness, involving costumes, noise-makers, and food. 3. There are four important mitzvot, commandments, that are required for the holiday. 4. First is to hear the Megillah, the Book of Esther, read aloud. This is usually a lot of fun -- we read the whole story or sometimes tell it in a "Purim Spiel", a play that tells the story. When we hear the name of Haman, everyone makes a lot of noise using their graggers (noisemakers of all kinds), to "blot out" the name of the evil man who tried to kill all the Jews in Persia. 5. Second is to celebrate with a Purim Seudah, a Purim meal and party. What could be better than a holiday that requires a party? We usually celebrate with a Purim Carnival, which is a lot of fun for everyone involved! 6. 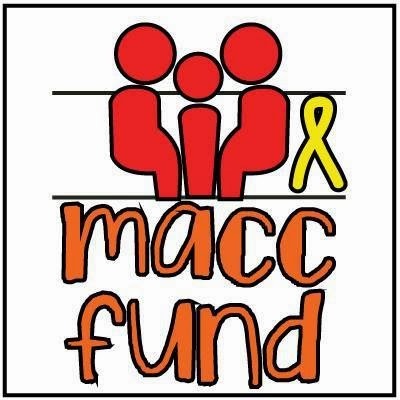 Third is the requirement to send Mishloach Manot, gifts of food and treats that are sent to friends and family. It is a lot of fun to do and a wonderful way for me as a Jewish girl to make use of all the fun holiday treat ideas that I bookmarked back in November/December...in preparation for Purim! 7. Fourth is the requirement for Matanot L'Evyonim - gifts of money or food to support the poor. This is such a wonderful part of every Jewish holiday, making sure that even those who are in need can celebrate on this day. 8. The day before Purim is the Fast of Esther, in which we recall how Esther fasted before she approached the king to ask for his help. Some women have taken this day as an opportunity to remember those women who are trapped in marriages without the ability to get an Jewish divorce. These women are known as agunot, chained women, as their hands are tied by the rabbinic courts, which won't give the divorce without the consent of their husbands. Read more about agunot here and here, and here is one event in Jerusalem in honor of Yom ha-Agunot. 9. One of the most well-known Purim treats is the hamantashen, a three-cornered filled pastry. Yum! 10. Every year my mom makes a million hamatashen, using my great-aunt Dora's recipe. In 1976, my mom followed my Aunt Dora around and measured after she put it all in the bowl in order to "capture" the recipe. And you know what, it's a fantastic recipe. I even have some to take with me to Israel to my brother. 11. It's also customary to drink alcohol at Purim celebrations, "ad lo yada..." "A person should drink on Purim until the point where they can't tell the difference between "Blessed is Mordechai" and "Cursed is Haman." (Talmud - Megillah 7a; Code of Jewish Law 695:2) Obviously, alcohol should be used in moderation. I think this gives us the reminder that the holiday of Purim is a wonderful opportunity to celebrate for adults as well! Too often this holiday is relegated to a "children's celebration" but there is power in adults finding silliness in their lives once in a while too. 12. The Book of Esther has no mention of God in it. We remember God's "hiddenness" when we hide ourselves behind masks to celebrate this day. We remember that God's name may be hidden, but we are all God's agents in the world. Esther has to take matters into her own hands. Sometimes we have to remember that we are all created in the image of God, and we should act like it! 13. One of the most interesting characters in the Book of Esther is Vashti, the king's first wife, who refuses to dance naked for her drunk husband. She is replaced as the queen by the lovely young Esther. Vashti is a strong, powerful woman who isn't afraid to say no. Esther is also strong in her own right, as she stands up for her people when asked. This is a great holiday for rockin' female role models! Like this post? Go rate it on JBlog...please? But I think it's fun to do these things and it's the little things that I can contribute to my son's preschool classroom. 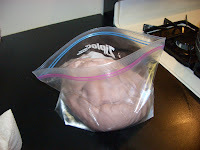 So I like to make play dough. 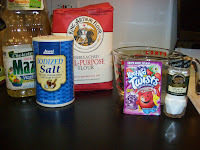 You need: 4 cups flour, 1 cup salt, 4 cups water, 4 tablespoons oil, and 1/2 cup cream of tartar. Plus one packet of koolaid for color and scent. Pick a nice simple bright color. The grape is not really purple enough, imho. Put it all together into a saucepan. 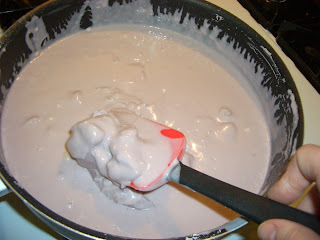 Cook and stir pretty frequently over medium-low heat until it starts to form together. It will seem to take a long time to get there. Stick with it. You didn't do anything wrong! It will start to come together and then just keep stirring. 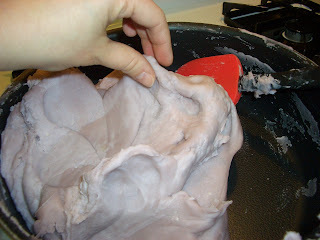 Until you can squish it between your fingers and it's no longer sticky, but formed into playdough consistency. At our pre-school's Purim Carnival, they have a play-dough room. Each kid gets a small bagfull of the stuff to play with and then take home. Great idea! It's hard to believe that my baby my oldest child who was just born who is already 6 years old, who entered kindergarten this year...is now one tooth short. Yep, that's right. 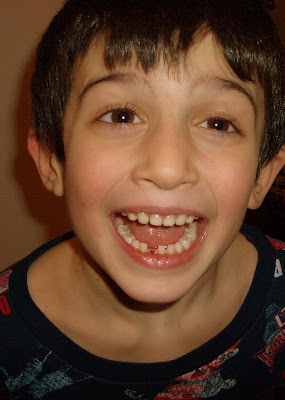 A lost tooth is just the beginning. Next it's a driver's license. But it does mean the Tooth Fairy and who knows what's next!? Each moment brings its own blessings. A little sad, perhaps, that he isn't the little boy that he was. But joyous in knowing that he is on the miraculous journey of life into becoming the menschy, kind, wonderful person that I already see growing before my eyes. Shehecheyanu, v'kiyimanu, v'higiyanu lazman hazeh...thank You, God, for bringing us to this toothy milestone. Time to keep the books. of how much was used. were made next by the artists. were the words "Holy to God"
They brought it to Mo. and saw they had done it all. So he blessed their work. to set it all up and use!" Mo did what God said. then they did not go. with them day and night. Be strong, be strong, and let us strengthen each other! Visiting the Western Wall of the Temple Mount (Kotel in Hebrew) in Jerusalem is, for me, a most spirited and spiritual experience. It's spiritual because this place, while merely a wall of stone, is in truth the central focal point, the closest we can stand to the Holy of Holies, an connection to the past that cries out with a sacred intensity. It is spirited, because each moment there is fraught with political and social complexity...I do have to focus myself and breathe in the stones deeply in order to find the peace I desire in this place because I am so easily distracted by the (sometimes) technical aspects of the visit. Men and women are not allowed to pray together at the Kotel and this frustrates and annoys me...I must remind myself to be in my own moment, in my own circle, and find my own peace. Many people wash their hands before approaching this holy site. This is not about cleanliness, but rather about ritual purity. I love the image of washing away the rest of the world to step into this place. There are many old women who spend their days at the Kotel, giving blessings and collecting tzedakah, money for the poor. This woman blessed me and my children, asking about my husband, my life, and offering her prayers in exchange for my tzedakah money. The stones of the wall are old and worn, from generations of caresses and kisses. It is customary to place notes in the cracks of the Kotel, personal prayers that are too precious to be said aloud, too precious to let float away on the wind, but rather clutched tightly in the hand and then wedged tightly into the holy stones. God is everywhere, but I am different wherever I go. At the Kotel, I feel a difference in me as I stand shoulder to shoulder with the past...and I find a different connection, a different spirit. Um...why do I think this is going to end badly? How do they get these little peppers such a bright color? Are they dyed? When you wash the red ones, some red comes off in your hands...is that dye? Or just natural coloring? As I did the quiz, I was, of course, in bare feet. We have a shoes-off policy in our house, partly because of our pretty new carpet, mainly because I think it's healthier not to bring all that outside dirt into the house, but also because I'd much rather be barefoot! How do you think the computer knew that? One year ago...I was waiting eagerly for my water to break...that is what happened with each of my first two pregnancies, and I went to bed every night expecting it. But not so with my girl. She really wanted to stick around inside. The doctor and I had other ideas and we induced labor on February 16, disturbing her cozy little nest. And it only took her about 3 months to forgive me. Yes, that's right. 3 months of never-stopping crying, screaming, and not-putting-downness. Wouldn't take a bottle. Breast only. Wouldn't take a pacifier. Spit up a LOT because she wanted to nurse all the time! But finally, at 3 months, it all clicked. She forgave me for her induction into the world! She started to take a bottle (good thing, too, because that was the end of my maternity leave - I even considered extending it! ), she took a pacifier and sometimes her fingers, and she learned to roll over (even though the doctor said it was a fluke). Basically, she turned into a wonderful baby! She started to nap, (she didn't sleep so well at night but I'll take the blame for that one, I kept going in so she wouldn't wake her brothers) and she started to smile and interact happily with the world! Now at one, she's displaying a nice little personality and I can't wait to get to know her even better! This morning, she woke up at 6am and rather than cry she called out "Daaaadddeee!!!" which made us both giggle. Her inflection was perfect, a sing-song just like her big brothers. She's a climber, and she loves music. She dances and giggles. She still loves to sit in the sling, although now she can pull my hair. She'll eat almost anything you put in front of her but never touches the french fries (seriously, maybe she's not my kid?). She pushes her brothers out of her way when she wants something and she wants to be just like them. She absolutely adores my blackberry and any other gadget...the tv remote, the video game controller, anything. My Outsourced Life by AJ Jacobs, a really funny and slightly scary article...I met him today! Plus a bonus....this is pretty darn funny. I'm sure I'm the last person to find it but I still thought it was cute! From my del.icio.us...where have you been? I so clearly remember sitting in my first grade classroom, making lion and lamb masks and learning the phrase "March comes in like a lion and goes out like a lamb." For a little March inspiration, with prayers for a quick spring...here are some more pictures of my Israel trip...one from Masada and one from Ein Gedi. That sky is just so blue!!! !